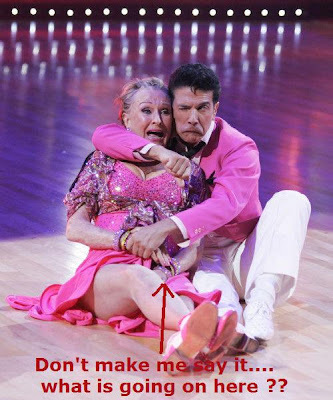 Is anyone else tickled pink to see Dancing With The Stars add a few new dances to their repetoire? 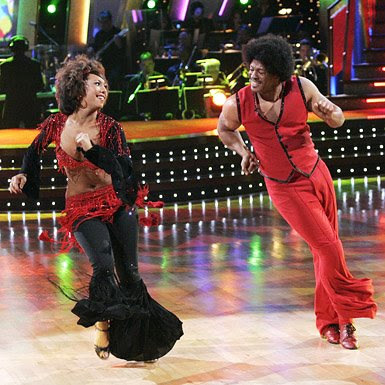 Like Cheryl and Maurice doing the Hustle...I loved the get-ups and Cheryls Fro...which took the emphasis off the rumors of her weight gain of five pounds. I couldn't help getting up and dancing with them...every so often shouting "get dowwwwnnnnn". You guys thought I wasn't paying attention this week...but I fooled you, I watched and I danced and boy did I have fun. It's too bad Chef Rocco didn't make the cut. But come on...who would vote for someone with those ruffled sleeves? Now isn't that much better? They should have ripped them off sooner. But look who is still Stayin Alive? Good ol' Cloris! I have to say she did a pretty fine job this week...look at that leg spread? Holy cat's pajamas! Grand Marshall of the Tournament of Roses Parade. I can't think of a better choice. This is the parade of my childhood. My grandparents lived three doors up from the parade route on Colorado Blvd. in Pasadena, and what memories! The only other Grand Marshall that I got excited about was Kate Smith...as she belted out God Bless America. Ok, I liked Kermit The Frog too. So who's next to get the boot? Could it be Miss Botox Ericka Kane? With that catty comment being said, she still looks good for her age. Very funny. I am glad to see ol' Cloris has a huge fan base to keep her there....hip hip hooray for old ladies!! Erika Cane uses botox?? shocked! That is so cool to have the great memories of the Rose Parade. 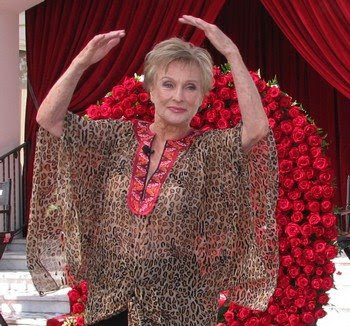 Although I don't watch this show, I do love Cloris Leachman and am rooting for her to win. Grandma J., with all that dancing you do, maybe we should write to Hollywood and recommend you as a contestant in the next round? I think you'd be grand. 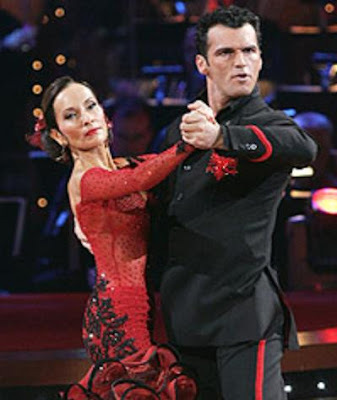 I'm very excited about the new dances, especially the jitterbug. I love to jitterbug! I was pretty impressed with Cloris' leg kick, but I think Corky actually lifted her off the ground when he lifted her leg. I love Cloris...but I think she may be coming close to elimination. I miss Kim K. and wish she was still on. And Cheryl is my favorite dancer and I think she looks great by the way! And happy belated bday to Mike- you're favorite child! All your girls know this and we have accepted that your only son is your fave. We still love you, but it is what it is. I so recommend you for the next round!!! I would love to see you dance & would totally start to vote :) Last night we had a late supper and I demanded SILENCE so I could listen to DTWTS. Ready for Ericka Kane to go fer shur! I loved the little kids last night. They rocked. I love CLORIS! She is so funny! Thanks for all the pics Grandmaj. I dvr'd it but haven't watched it yet. My tv privileges have been given up till Jim leaves in January. I figure he won't be able to watch that much in the hill of Afghanistan so I'll let him watch it now. I know I don't comment often, but you always make me smile and you crack me up. CBW and Hollywood...I'm sure you both would get pleasure out of seeing me make a complete arse out of myself dancing on tv. Never gonna happen. But just know it wouldn't be pretty...not even. The kids were great! Now for some jitterbugs. Sadly they wont be doing the hokie pokie. For those of you who don't know. Grandma J is the first blog I stumbled upon. Ever. She was so funny, I decided to try. Although I'm nowhere near as funny she is my inpiration for starting this little bloggy of mine. I can't believe she has read mine now. I think I will faint. Now that I'm breathing again, thanks for coming by Grandma J. I'll keep your SIL in my prayers. They sound as if they're leaving about the same time. grandma J....you won the tote bag on my giveaway!! woohoo!! Send me an email with your address so I can get your gift out to you.